We All Know That Sleeping With Makeup On Is BAD, But What About A Quick Power Nap? If you're a makeup junkie like I am, I really HOPE you don't sleep with your makeup on. While you hit snooze, your skin rejuvenates and heals. 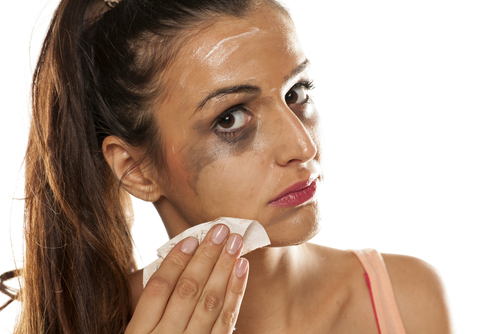 Sleeping with makeup on could lead to breakouts, clogged pores and wrinkles. A full face of makeup works against your skin's natural repair mechanism while you sleep and doesn't allow your skin and pores to breathe. Not to mention that the dust, dirt and pollution you were exposed to all day long sticks around. Just thinking about all of this makes me cringe! Now I'd like to tell you that it's VERY important to get your 8 hours of beauty sleep, that sleep is just as good for your beauty as it is for your booty. Yes, ladies if you didn't already know - getting the required amount of shut-eye every night helps your skin and your body too. But let's be realistic - given our fast-paced lives, very few of us manage to get the required amount of sleep at night. That's when power naps kick in. If you're lucky enough, your workplace promotes the concept and if you're not - it's best to get some shut-eye on your way to work or while coming back. Now does that mean you have to keep wiping off your makeup repeatedly? No. I know you spent 20 minutes perfecting that 'no makeup' look, so I'd never ask you to do it all over again! If you're going to take a quick snooze that's shorter than an hour, by all means, feel free. But if your power nap is likely to last through the afternoon then please keep some makeup remover or cleansing wipes handy. I urge you to wash your face before you decide to take a long nap, your skin will thank you later. Believe me! Here are 5 products for the lazy girl that will make your makeup removal quick n' easy! This is the easiest way to take your makeup off in my opinion. Just slather this oil onto a dry face and rub it around and your makeup will melt off. Add some water after a minute and the solution will begin to emulsify into a face wash. Wash your face and pat dry - squeaky clean! If you don't fancy carrying around a liquid makeup cleansing oil in your purse, this cleansing balm is perfect. It does the exact same thing as the cleansing oil and it's easy to throw into your purse or travel bag. If you can't make it to a sink to wash your face, no worries. This is a makeup remover cloth that makes taking makeup off as easy as a wipe off! Just wet the cloth with water and wipe off your makeup, it literally takes off even waterproof makeup like a dream. Just make sure you throw the cloth into the washing machine before using it again. This is one of those products that live on my nightstand and in every purse I carry. Fix makeup mistakes, take makeup off and refresh your face on the go. A makeup remover wipe is going to be every makeup junkie's BFF. Here's a quick n' easy DIY tutorial too! That's all ladies, now you NEVER have an excuse for sleeping with makeup on! Even when you're drunk!